Your quiet afternoon playing video games is interrupted by a whirring noise and a loud bang! You rush to the window and look. Out on the neighboring field you see it - A large flying saucer and dozens of angry looking MARTIANS!!! Well, at least your day won’t be boring! 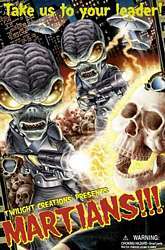 Martians!!! Drops you into the middle of the first wave of a large-scale alien invasion. Armed with only your vast knowledge of sci-fi movies, you decide that it is up to you to save mankind from certain intergalactic slavery. First things first, let’s get the gaming group together! Martians!!! can be played either as a cooperative game or a noncooperative game.